Time for a visit to the surface is looooong overdue ! I can sympathize with your point of view, HM. 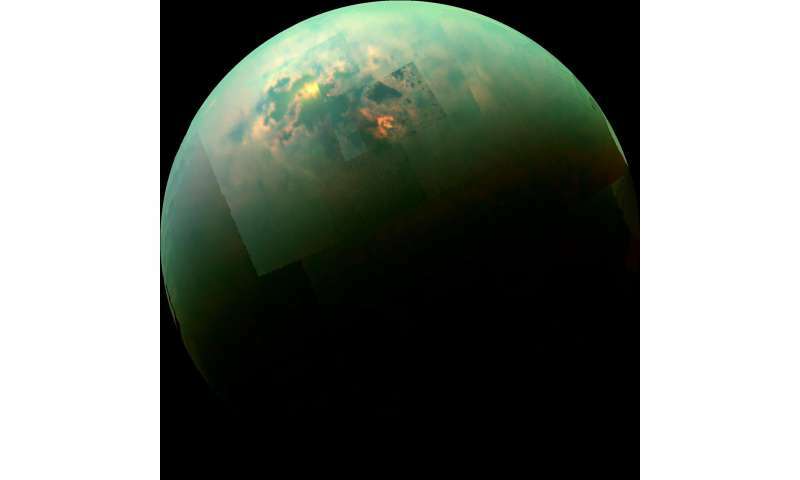 However, Titan is one of the very few, very improbable possibilities of finding Life off Earth. Compared to the Earth's biosphere? I prefer Titan over Mars or any of the ice-covered ocean moons. It is my opinion that Mars life has been coprolites for billions of years dead. & that the ocean moons will be found sterile. This is, I believe the very best reason NOT to rush probes to the surface of Titan. It would not be useful to contaminate Titan's possibility of a biosphere! Carelessly contaminating it with Earthlife. & no, we do not know how to prevent such a catastrophe. The only real chance would be to follow my StepLadder Infrastructure Plan using orbital automated factories. Now comes the whining & the tantrums that Stepladder is too conservative & mature a pragmatic method. All the comicbook readers hate it. With what? No organism alive on earth can function at Titan's temperatures anyhow because the water in the cells freezes, and all the cells' lipid membranes would be dissolved by the liquid ethane. All the life that we could transport over would freeze and break apart. Are the words "hydrology" and "hydrologic cycle" used in the case of Titan due to a lack of a better word, or does the "hydro-" in this case suggest "hydrocarbons" rather than water? But here on Earth we do have exotic organisms that survive if not always thrive in extreme environments, Those maybe the causes of colorful icebergs? Though I suspect spores might be the greatest danger. Here on Earth, we do not know how to assemble & launch a spacecraft without microscopic stowaways. Protected from disinfectants & other forms of sterilization. & a full spectrum of radiations. Especially where over-heating is more damaging then getting temporarily frozen. A modestly conservative low cost program of orbital automated factories. Manufacturing wth continuous exposure to vacuum & radiation without any exposure to Earth Life. Ay least we'd be making a "sirius" effort to avoid our doleful history of scewups! It's as you suggest, the word hydrology is here being used in a sense of "liquidology", so is being used to describe the actions of liquid rain, lakes, rivers, etc. on Titan as analogues of what liquid water does on Earth. There's a similar use of the use of the word "geology" when used to describe rocks and sediments on Mars - even though there exists a word "areology" (from Ares = Mars) for that planet. But not many use the "proper" term. good question Sahstar. Perhaps you coukd message the researcher's listed for this article & get their opinions? Maybe see if wiki is accepting "hydro" for Hydrocarbons? Check around planetary astronomy sites & see if there is any sort of consensus? Then please post your results back to these comments. Should be interesting answers yo your questions. Very amusing if there is a lot disagreement among the professionals. That's always good for a chuckle or three! Not at -179 C. The chemistry of DNA doesn't work at all when all the water is frozen. The molecules and materials that form life on earth are mineral-like solids on Titan. Even the hardiest extremophiles would behave more like microscopic beads of sand. If there is biology on Titan, anything from Earth would appear to it like globs of molten magma looks to us, and behave the same when it cools down to ambient temperature. Imagine a space alien landing on earth, with blood of molten lead and flesh made of red-hot iron. Eikka, I agree with all your facts & figures. I just cannot support your optimistic viewpoint. I am not just a pessimist, I am a paranoid cynic. Belt & suspenders & heavy-duty industrial-grade staples attaching the top of my pants to the bottom of my shirt! Considering all that may be at stake? Not just for increasing our knowledge of the Universe but also for the survival of an alien biome. I cannot support any effort that would cut corners just to feed our egos with quick, eventually meaningless exploration. "Oh look! Another headline extolling our achievements to reach Titan." "Hooray for our team! " "Yeah, we did good. Pity about the collapse of the Titan biosphere." " Well, better luck next time,"
That is not the road I want to travel.
. I just cannot support your optimistic viewpoint. The only counterpoint I could see is that we would introduce organic chemicals to Titan that they already don't have, and those could then act as part of another type of life unlike ours and foreign to Titan as well. I.e. we could start a shadow biosphere that would compete as an invader. However, the same chemistry is already working there. The building blocks of DNA came to earth on asteroids and can be found in space - there's nothing we can add that they already don't have. If anything, the chemicals we would bring along would be food to life that already exists there. Alternatively, it turns out to be poisons, but the effect would be limited to the immediate surroundings. In a very very unlikely event, we could introduce something akin to a virus, but that's effectively a snowball's chance in hell considering how different life would be on Titan to function at all. You can imagine it the other way around: take a planet like Venus where everything is +200 C or above on the surface. Suppose a lifeform from Venus came to earth. If they could survive here, if it was possible at all, we would already have extremophiles that operate at temperatures of molten lead.